Powerful cleaning liquid with active ingredients. The product presents excellent penetrating ability in hard or soft woods. Use it to remove difficult, accumulated stains such as oils, salts, gray and black spots etc. Ready to use and easy to apply, it restores wood to their natural color without destroying them. 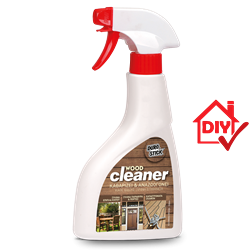 Highly effective cleaning liquid for outdoor wood surfaces and constructs, garden and terrace furniture (tables, chairs, benches etc. ), as well as pergolas, wood patios and pool decks, pleasure boat decks and other wood surfaces (existing doors and windows) to be cleaned. Protect the now clean surfaces using TEAK OIL of DUROSTICK or any one of the DUROSTICK wood varnishes. 1lt/6-10m2, depending on the absorbency and type of the surface of the wood.